Graphite, a time series database optimized for time series data collection, is a pretty attractive tool for gathering system metrics. Druid is supporting Graphite emmiter extension in it. 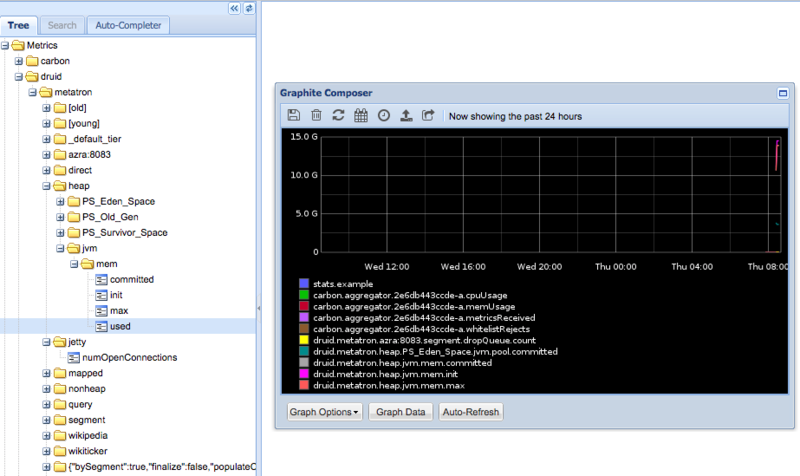 This extension emits druid metrics to a graphite carbon server. Detailed configuration information is linked here. This article describes how to monitor the Metatron system log using the druid-graphite emmitter. Metatron’s system monitoring with Graphite requires four prerequisites. Install the extionsion to all the boxes in the Druid cluster. $DRUID_HOME refers to the home directory where druid is installed. Edit druid “common.runtime.properties” file as shown below. # Configure the Graphite to fit your site. After restarting druid, if you see the following logs, the installation was successful. [main] io.druid.emitter.graphite.GraphiteEmitter - Starting Graphite Emitter. Now you can access to http://localhost:80, now you can see the graphite tree menu with druid/metatron.